As a journalist I’m privileged to travel to remote locations, meet beautiful people and hear incredible stories of God at work. Believe it or not one of these privileges is sitting in on meetings I wouldn’t otherwise be invited to. While going to meetings usually doesn’t rate at the top of my list of exciting things to do, I spent a few days sitting in the corner of a meeting that I have to share with you. 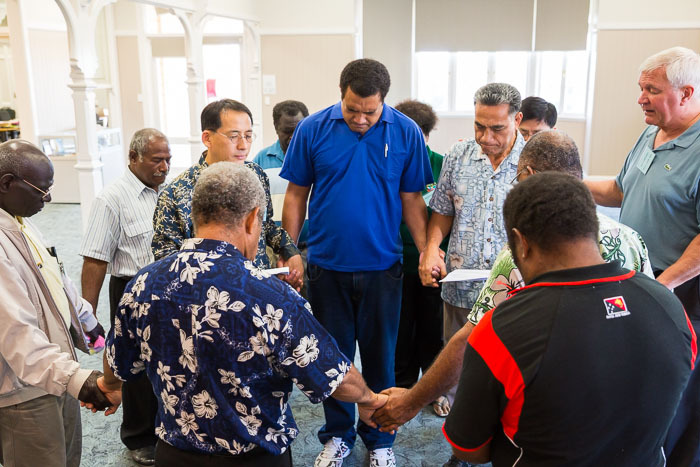 A handful of Pacific Islands leaders met in Brisbane in late August to share, learn and encourage each other. And I was one of few outsiders invited in. Spending time with this group of islanders is humbling. They know better than anyone the difference that God’s word in the mother tongue can have on whole communities and they’ve dedicated their lives to it. It is inspiring to listen to their stories and hear their enthusiasm for the work that is yet to be done in their country. Let me introduce them and share a few of their stories with you. Mark Sipaala is the director of the Boganville Bible Translators Organisation (BBTO) in PNG. BBTO evolved from a chapter of the Bible Translators Association (BTA) of PNG to manage the work in the province of Boganville and in anticipation when Boganville will secede from PNG. Boganville and PNG fought a devastating civil war throughout the 90s and Mark lost all the translation work he had done on his mother tongue throughout the 80s. He started over from scratch in 2000 after the peace agreement. Uiliami Fukofuka is the chairman of the board of the young and growing Bible Translation Organisation (BTO) of Tonga. A wise and humble man who previously served in parliament and as the principal of a large Bible college, Uiliami’s passion for Bible translation has him taking on this less-than-prestigious position as BTO Tonga struggles to gain credibility in the eyes of the Tongan church. In the strongly hierarchal monarchy of Tonga, translating the Bible into Tongan is an esteemed position and the differing opinions on the two translations of the Bible is a stronghold of disagreement among the churches. Named the ‘Bible Translation Organisation’ of Tonga, BTO is trying to break through any misconceptions about their intentions and fear that if they can’t gain awareness for their vision for translation in other language groups they will always be outcasts suspected of wanting to ‘rock the boat’. Uiliami is working hard at engaging the leaders of the churches to inspire them to once again send out missionaries to other parts of the Pacific. (Maybe they should rename as Wycliffe Tonga.)? Pastor Andrew Fanasia is missing from his chair for this photo. He is the chairman of the trustees for the Bible Translation and Literacy Partnership (BTLP) of the Solomon Islands. An incredibly intelligent man, in his other job he advises the Christian education programs of a cooperative of churches in the Solomon Islands. He wants to see the whole church in the Solomon Islands own the work of Bible translation. He mentioned during the meetings that he is discouraged to see so many churches using the English Bible instead of the national Pijin. David Brooks encouraged him with information from other parts of the world which has seen established bilingual churches use the majority language for the service, but the heart language for small groups with great success. He says that we must appreciate the difference between the ‘language of fellowship’ and the ‘language of discipleship’. 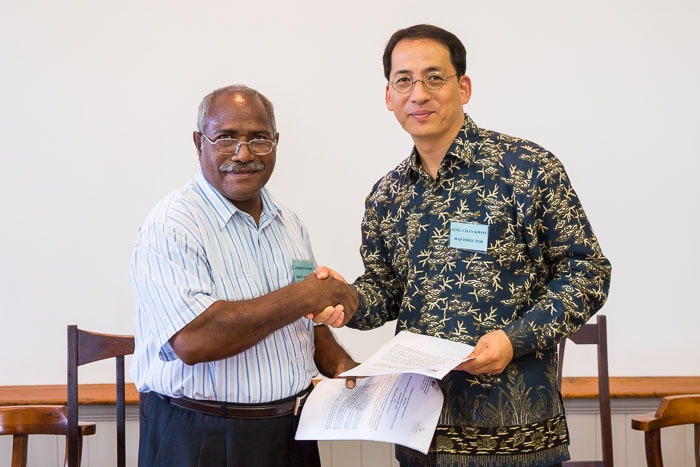 Andrew Fanasia and Sung-Chan Kwon have just signed an MOU agreement between BTLP Solomon Islands and the Wycliffe Global Alliance. David Gela wears many hats. The biggest two are as the long-time director of BTA PNG and Pacific Islands Affairs director – working closely with Sung-Chan. David Gela has been involved with BTA from the beginning, as a young man, and Wycliffe Global Alliance CEO Kirk Franklin credits him as his ‘mentor’ during his own time serving in PNG. David led the meetings and his casual humorous style keeps everyone at ease and in an ‘islander’ frame of mine. In the below photo he is telling a hilarious story about a physically aggressive missionary from an older era in PNG. David Brooks is part of the Global Leadership Team, one of the few people, like me, who are assigned to the international team of the Wycliffe Global Alliance to serve the many organisations which make up our vast federation. A Texan, his speciality is partnerships, and has a lifetime of experience in making friends in other cultures. Serah Markton is the Secretary of the Vanuatu Bible Translation organisation (VBT) and has worked in a supportive role in Bible translation for almost 30 years. As Secretary she struggles with the current set up of the VBT Board since all the members are translators out in their villages it is difficult to communicate with them. And their terms of service are quite short so she is constantly training a new director only to have them replaced. Pastor Andrew encouraged Serah to think about their model for a board since it is unusual to have only organisation members serve on an advisory board. He rattled off the board members of BTLP – 2 members of parliament, directors of various church bodies, representatives from education bodies, professors, veteran translation consultants, etc. Serah’s quiet “Ohhhh!” could be felt around the room as she leaned back in her chair. Sung-Chan and I exchanged smiles. Serah went off-topic after her formal presentation to talk about something meaningful to her which is a program she set up to give Bible translators’ wives in Vanuatu the opportunity to learn about translation. She found that the women were left out of most discussions and had no idea what their husbands were up to, or why. After the first workshop, one translator commented after his wife arrived home, “It must have been a good workshop. Now my wife understands about Bible translation and wants to support me now as I do the work!” Story on wycliffe.net. Tevita Lalahi’s enthusiasm is contagious. The youngest at the table, he is the director of BTO Tonga and I had the honour of writing a profile story on him and his wife Luseane last year. Tevita’s presentation reflected the ‘pain of growing’ he is experiencing building BTO Tonga from scratch while yearning to be working in PNG instead of sending others in his place. (Tevita’s face lit up whenever PNG was mentioned, which was often!) Sung-Chan jokes that Tevita wants to be the first Tongan Bible translation advisor but he has asked him to be the eleventh! Tevita always laughs, but actually, it is not a joke. Sung-Chan challenged Tevita to send 10 Tongans before going to the field himself. BTO Tonga is growing rapidly and they are also growing tomatoes to raise funds to pay for training for their 4 young staff members. Tevita also reported that his family now has their very first financial supporter – another family from their church. Joseph Hong works on the Wycliffe church engagement team from South Korea and attended to assist with training and reflection on the church’s role in Bible translation. 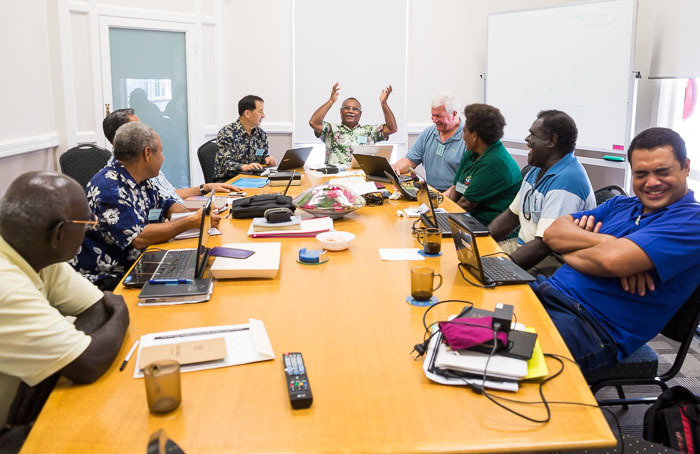 As you can see, David Brooks and I are the only native English speakers in the room, yet the whole meeting was conducted in English with little bits of Pidgin exchanged between the Melanesians. 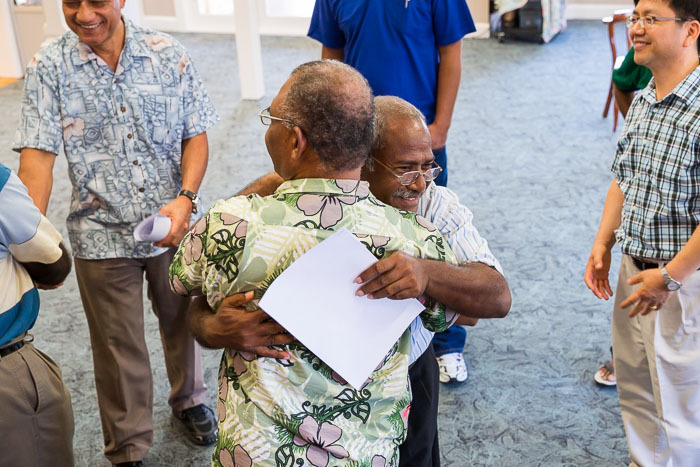 As an observer, it was obvious to me how much each person delighted in meeting together with other Pacific Islanders to learn from each other and encourage one another. They shared challenges and victories and prayed passionately together. New friendships formed and new invitations extended. They asked if they could meet more often. 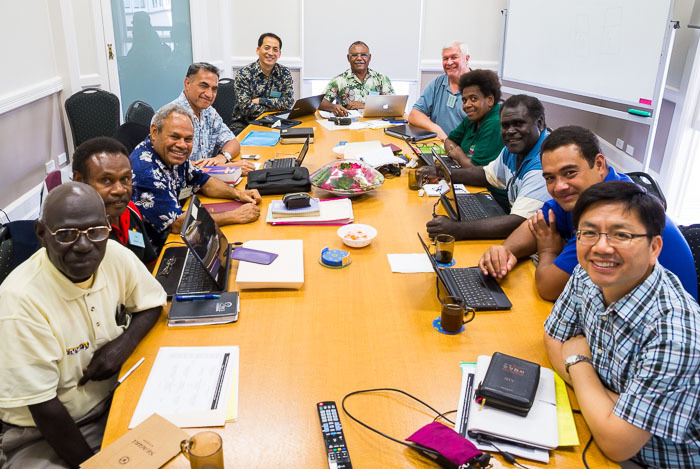 The group ended the week with renewed enthusiasm, new ideas, things to chew on and, most importantly, the knowledge that they are not alone in the ministry of Bible translation in the Pacific.